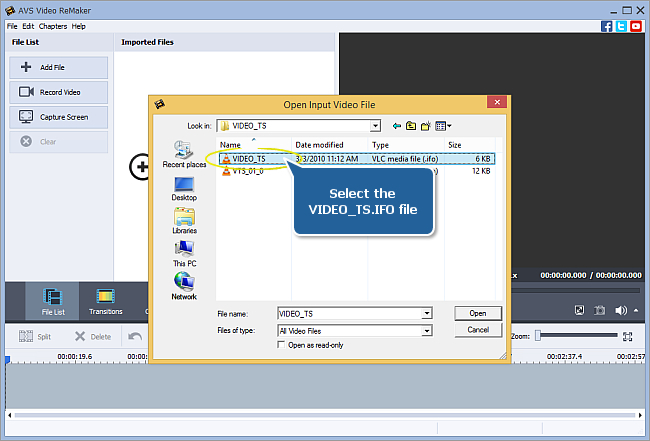 How to edit home DVD video with AVS Video ReMaker? If you have a DVD camcorder and like shooting video with it, it is often necessary to quickly edit it cutting the unnecessary scenes and episodes and leaving only the ones you need. Using AVS Video ReMaker you can do that quickly and easily. Moreover, you will not even have to reconvert your DVD video afterwards and will be able to create a DVD menu for your resulting disc. The program will burn the disc for you using the internal burning engine. 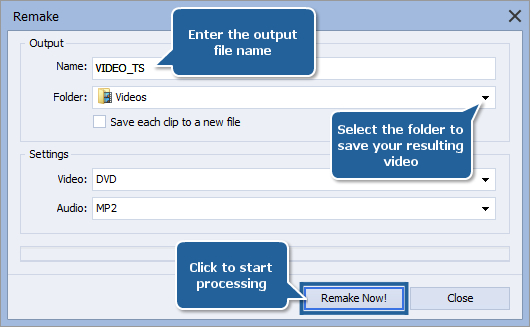 After loading your DVD, you can add more video files to AVS Video ReMaker using the Add File button or remove the loaded files clicking the Clear button. Note: in case you add several different video DVDs to the program all of them must have the same parameters - video resolution, aspect ratio, frame rate and bitrate. Using the Multi Trim option you will be able to detect all the existing scenes in your video automatically and delete several scenes at a time. Click the Trim button on the Timeline Toolbar to open the Multi Trim window. Note: if you have loaded several files into the program, first you need to select one of them on the Timeline. In the opened window press the Detect Scenes button located below the Preview area and wait while the program detects scenes. It may take some time depending on your video file length. 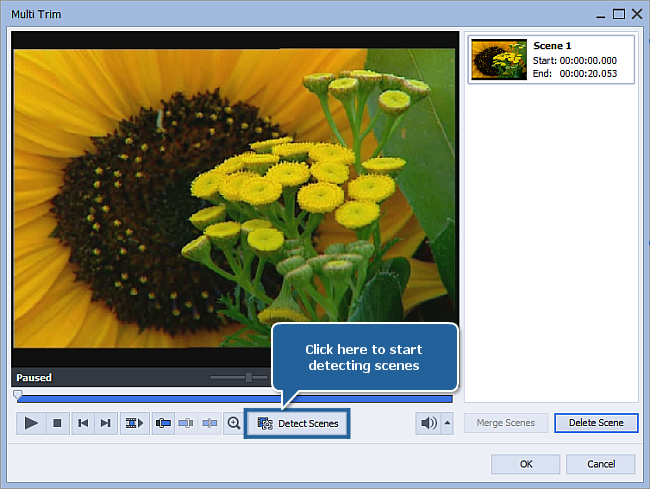 All the detected scenes will be displayed in the scenes list on the right. Select the scene your want to delete by clicking it with the left mouse button. To select several scenes press and hold the Ctrl key on the keyboard. 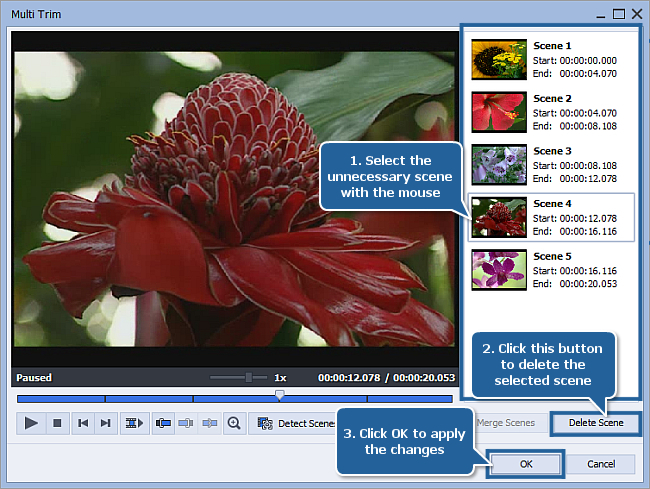 Press the Delete Scene button below the scenes list to remove the highlighted scene(s). Click the OK button to apply the changes made and close the window. 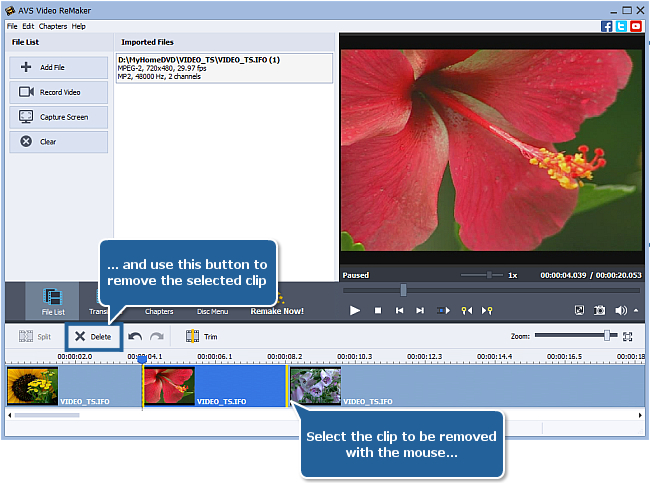 To manually select clips for deletion, use the Timeline. Move the slider of the Timeline Scale to find the beginning of the clip to be deleted and click the Split button above the Timeline. Then do the same to mark the end of the video clip to be deleted. Use the Preview window to make sure that you marked the right part for deletion. After splitting your video into clips please select the clip your want to delete by clicking it with the left mouse button and press the Delete button above the Timeline. The highlighted clip will be removed. 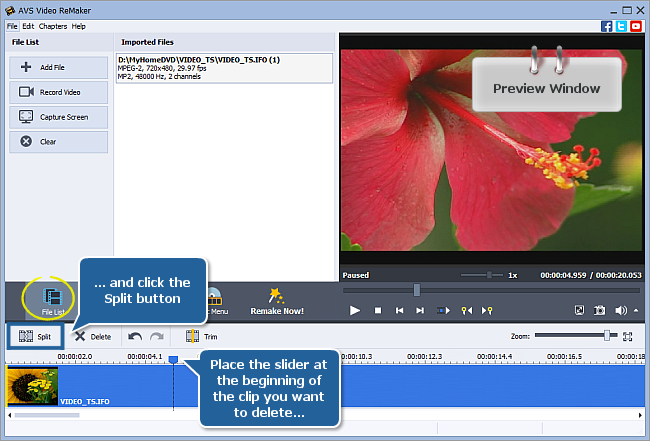 After selecting all the clips for deletion, you can create a menu for your DVD video. Please refer to the How to create a disc menu using AVS Video ReMaker? guide to learn how to do it. 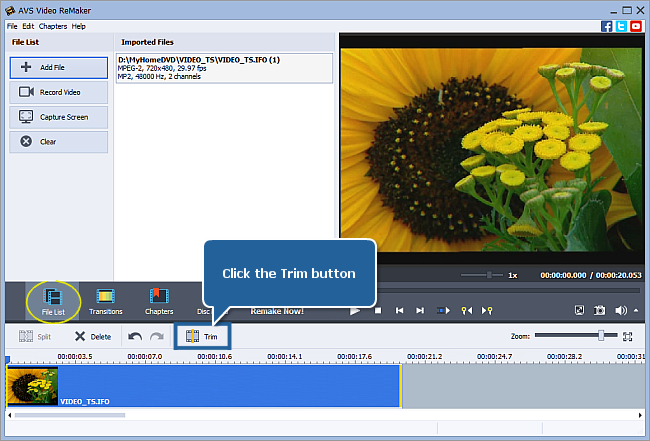 Click the Burn to Disc button to launch the AVS Video Burner application to record the resulting video onto a disc. Insert a blank DVD into your computer optical disc drive. Make sure that the disc is compatible with your drive. AVS Video Burner application will be launched to guide you through the burning process so that you could record your converted video onto a disc. Now your DVD video is ready to be watched using your personal computer or home DVD player!